It’s just like a live computer game. 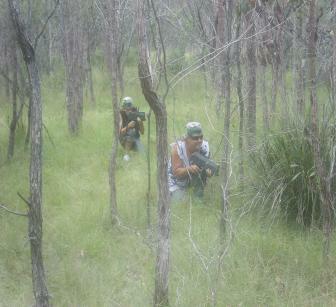 Laser Skirmish is a complete, balanced and fully play tested game system. It is a team combat simulator played in a variety of locations such as bush land, around buildings or schools and in huge warehouses. Laser Skirmish equipment is 100% portable, tough and weather-proof The game is completely mobile and versatile, so we can also run at your fete, festival, party or practically any other event. The technology enables an extended range of infrared units in all playing conditions. Extensive testing was carried out to achieve optimal levels of range and firepower of each gun/sensor for the most satisfying gaming experience . The effect is a game so thrilling you will want to play over and over again. The combat game of Laser Skirmish has been influenced by modern computer games and military training scenarios. These scenarios provide team members the opportunity to overcome adversity together, and gain greater understanding of themselves and the team. But most of all it is adrenaline-pumping fun!! The technology has been "Time Tested" by numerous military training facilities worldwide. The core technology used is focused infrared light. · What you see is what you get. · What you hear is what you get.